Just one week ago, on Sept. 7th, a huge sunspot rounded the sun's eastern limb. 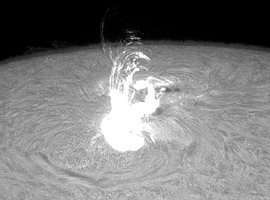 As soon as it appeared, it exploded, producing one of the brightest x-ray solar flares of the Space Age. In the days that followed, the growing spot exploded eight more times. Each powerful "X-flare" caused a shortwave radio blackout on Earth and pumped new energy into a radiation storm around our planet. The blasts hurled magnetic clouds toward Earth, and when they hit, on Sept 10th and 11th, ruby-red auroras were seen as far south as Arizona. Image: An X-flare photographed on Sept. 9th by Birgit Kremer of Marbella, Spain. So this is solar minimum? It has not been quiet. 2005 began with an X-flare on New Year's Day--a sign of things to come. Since then we've experienced 4 severe geomagnetic storms and 14 more X-flares. "That's a lot of activity," says solar physicist David Hathaway of the National Space Science and Technology Center in Huntsville, Alabama. Scientists like Hathaway track the 11-year solar cycle by counting sunspots. When sunspot numbers peak, that's Solar Max, and when they ebb, that's solar minimum. This is supposed to work because sunspots are the main sources of solar activity: Sunspot magnetic fields become unstable and explode. The explosion produces a flash of electromagnetic radiation--a solar flare. It can also hurl a billion-ton cloud of magnetized gas into space--a coronal mass ejection or "CME." When the CME reaches Earth, it sparks a geomagnetic storm and we see auroras. CMEs can also propel protons toward Earth, producing a radiation storm dangerous to astronauts and satellites. All these things come from sunspots. As expected, sunspot numbers have declined since 2000, yet solar activity persists. How can this be? Hathaway answers: "The sunspots of 2005, while fewer, have done more than their share of exploding." Consider sunspot 798/808, the source of the Sept 7th superflare and eight lesser X-flares. All by itself, this sunspot has made Sept. 2005 the most active month on the sun since March 1991. Weird? Much about the sun's activity cycle remains unknown, Hathaway points out. "X-ray observations of flares by NOAA's Earth-orbiting satellites began in 1975, and CMEs were discovered only a few years earlier by the 7th Orbiting Solar Observatory. Before the 1970s, our records are spotty." This means we don't know what is typical. Scientists have monitored only three complete solar cycles using satellite technology. "It's risky to draw conclusions" from such a short span of data, he says. Sunspot counts and X-flares during the last three solar cycles. Note how solar activity continues even during solar minimum. Credit: David Hathaway, NASA/NSSTC. Hathaway offers a cautionary tale: Before 2005, the last solar minimum was due in 1996 and the sun, at the time, seemed to be behaving perfectly: From late-1992 until mid-1996, sunspots began to disappear and there were precisely zero X-flares during those long years. It was a time of quiet. 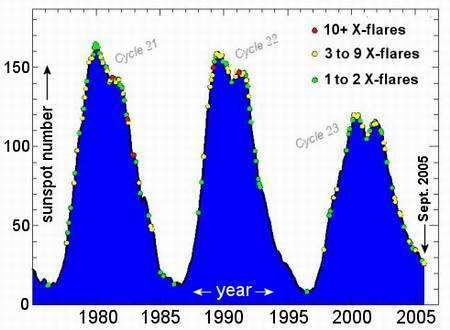 Then, in 1996 when sunspot counts finally reached their lowest value—bang!—an X-flare erupted. "The sun can be very unpredictable," says Hathaway, which is something NASA planners must take into account when they send humans back to the Moon and on to Mars. Returning to 2005: is this year an aberration--or a normal rush to the bottom of the solar cycle? "We need to observe more solar cycles to answer that question," says Hathaway. "And because each cycle lasts 11 years, observing takes time." Meanwhile, Hathaway is waiting for 2006 when solar minimum finally arrives. Who knows what the Sun will do then?